I am really excited about my book, recently published by the American Bar Association. This book is designed to help everyone take charge of their cybersecurity, to learn the underlying principles and how to implement security measures. 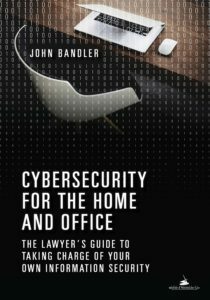 Hear me talk about the book and cybersecurity in my podcast. I created a website to parallel the book here, and you can now buy the book through Amazon or Barnes & Noble. The article is behind a paywall at the ABA site, I hope to be able to host it on JohnBandler.com soon. By John Bandler, published October 17, 2017, in the Huffington Post and also hosted at johnbandler.com. The article is hosted and reproduced on JohnBandler.com with permission from the ABA, Copyright 2017 ABA with all rights reserved by the ABA. The original article is behind a paywall at the ABA here. By John Bandler, published June 5, 2017 in the Huffington Post. As former FBI Director James Comey prepares to testify before Congress this week, it is worth reflecting about how poor cybersecurity choices gave rise to today’s current events and our nation’s current crisis... There are three important cybersecurity lessons we can take away from the election and today’s current events. Cybercrime for profit is a global economy that causes most of our cybersecurity and fraud woes and it is a problem to which all anti-money laundering (AML) and financial sector professionals should pay close attention. It is adaptable, ingenious and lucrative, while imposing vast costs on us. It victimizes financial institutions and their customers, and it uses our financial system as a conduit to transmit illicit profits and payments. Cybercrime for profit also provides a foundation for many other types of cybercrime, including hacktivism and nation-state attacks. The remainder of this article is available through the ACAMS website here. Cybercrime-for-profit has become an enormous industry, and is the cause of most of our internet and information security problems. In order to combat cybercrime, we need to understand how cybercriminals are paid and how they launder their proceeds, and realize that they make heavy use of digital currencies. Thus, we must understand digital currencies and other digital payment methods, and how they can be misused for criminal purposes. If you have clients that exchange digital currency, or accept digital currency as payment, then they should be aware of the risks of being used as a conduit for cybercrime digital currency proceeds, so that they don't unwittingly assist the criminals in their crimes. This will help your clients mitigate reputational, regulatory, and legal risks. The remainder of this article is available through the ABA website here. Cybercrime and identity theft have evolved into a sophisticated global economy. Perpetrators use the anonymity provided by digital currency and the internet to hide themselves, their criminal acts and their gains. This nine year cybercrime investigation case illustrates one of the few law enforcement successes in fighting these crimes. See the ACFE's Fraud Magazine website here for the remainder of the article (membership/subscription may be required).